There is a pig-crazy chef cooking at Camphors restaurant in Somerset West. You’ve probably heard of him, or tried his food. PJ Vadas cut his teeth internationally while slogging crazy hours at Gordon Ramsay’s London and New York restaurants, returned briefly to help his parents at the family’s modest Pembreys restaurant in Knysna (there he was one of the first local chefs to use a sous vide water bath), before joining The Roundhouse in Cape Town for a few years. When it was time for a change, fortuitously the opportunity to open Camphors fine dining restaurant at Vergelegen landed in PJ’s lap. The name refers to the camphor trees, planted in 1700 outside this Somerset West property’s historic homestead. This sort of restaurant rarely makes money, but then one of South Africa’s largest and arguably most beautiful wine estates deserves a show-off dining spot (the casual Stables restaurant on the property brings in the cash). One year in, Camphors has already made the 2013 Eat Out Top 20 restaurant list. Go for lunch with a good friend keen to appreciate the expansive gardens and enormous trees while meandering to your car. The invitation was for two of us to try out six courses from a settled-in kitchen. The dishes mostly appear on the a la carte menu too, and change with available ingredients. The décor features grey, black or silver, and is quite splashy and sparkly in that way that might make you feel uncomfortable taking a group of unruly friends or young kids. Sommelier Christo Deyzel takes care of the exclusively Vergelegen wine selections, and does a more-than-adequate job of matching their food-friendly bottles to the dishes. I could do without having my chair pulled out every time I return to the table, but that’s a minor quibble. Back to the pigs. This is an offal-mad chef who tweets pics of porky heads from his kitchen, so I wasn’t surprised to be served bits and pieces of one as an eye-and-palate-pleasing amuse bouche. Crunchy bits of pig tail in homemade mustard and Vergelegen honey; crispy crackling, a cured then deep-fried piece of pig’s ear. 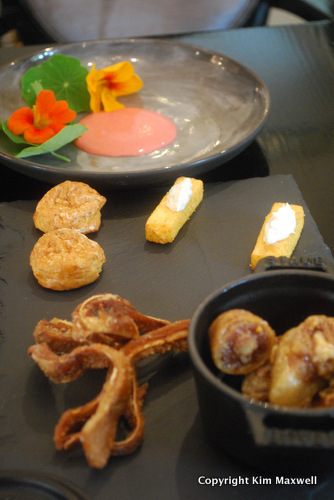 It’s usually what I’d call ‘squeamish’ food, but it wasn’t really, just adventurous nibbles. Also on the plate, a clever fish ‘n chips combining polenta-like ground chickpea ‘chips’ topped with smoked snoek. PJ has started a butchery on the farm where beef from Vergelegen’s free-range Nguni cows is processed for the restaurant, and has some bloody tales to tell. The creamy biltong filling inside a choux paste gougère made me want more. Eating here you feel like you’re being treated with special food, where as much as possible is grown on the estate: honey, free-range Nguni beef, edible flowers and herbs. If it’s bought in, it’s because somebody else is doing it better: so the pork is from Bonnievale, the buffalo products from Wellington, the excellent breads from a Woodstock artisan baker. A lot of dishes arrive with ingredients on a plate, waiters then pouring in sauces or creamy veloutés. There’s a bit much of that for my liking, but it forces diners to notice the various components and I can’t fault the resulting flavours and textures. This chef understands what his ingredients are capable of, and puts on a great show. A standout dish was the duck. The fuchsias and pinks so pretty it felt almost a shame to eat it. 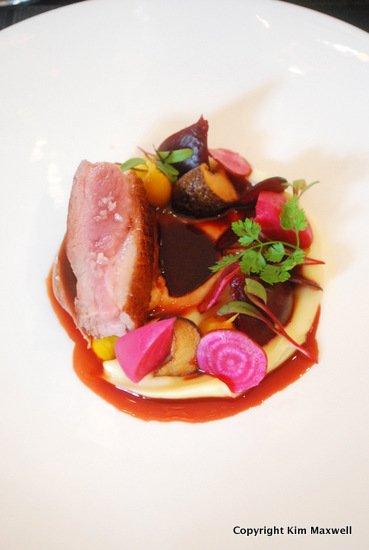 Hay-smoked breast served with parsnip puree and shitake shrooms, with fall-off-the-bone salty duck leg ham, a pool of jus, and slivers of baby beets in sweetish pickling brine. Vergelegen Shiraz 2010 was rich yet restrained, a plummy partner. Press rewind to an unusual and brilliant early course of torn strips of Buffalo Ridge buffalo-milk mozzarella. 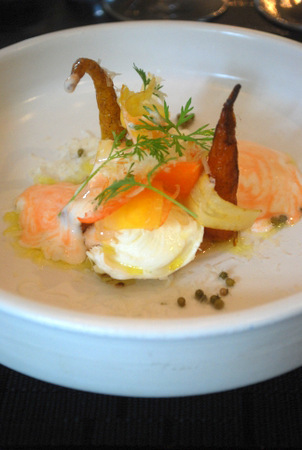 Lightly roasted yellow and orange carrots – raw or undercooked things is a trademark of this dish – a slice of two-year-matured buffalo-milk Provolone blowtorched to warm semi-rubberiness, zingy carrot puree topping. A thick swirl of cold buttermilk and carrot poured over, and from nowhere a hit of pickled green coriander seeds. Served with zesty orange peel nuttiness of slightly wooded Vergelegen Chardonnay 2012, this dish was spectacularly smart with its slightly cooked, salty, tangy and pickled combos. Probably my most spot-on food and wine match was the simplicity of hake and gnocchi with Vergelegen White G.B.V. 2011. This flagship white of barrel-fermented Semillon with zingy Sauvignon is one of the estate’s most awarded wines, and typically takes years to come around. 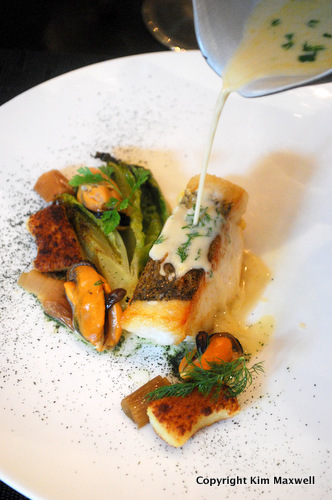 Seared hake with West Coast mussels (their liquor captured in a creamy velouté) partnered lightly smoked leeks and potato gnocchi, surprise twists in seared Cos lettuce and a dusting of seaweed. Simple, nourishing and classic while making the wine shine. Classic styling is the common thread underlining all Camphors food. Scoffing at modern dining trends that try to redefine boundaries, PJ says he likes the classics. ‘Food must be delicious and taste like something.’ You can’t fault his philosophy. At Camphors it’s the details that add value. The miniature saucepan of oxtail pie, served alongside the fiddly every-element-in-its-place grassfed ribeye dish, which speaks of comfort and love. Or the pastry chef poached from The Roundhouse. I didn’t catch her name, but could see why she was. Her buffalo ricotta cake is the sort that makes you smile when it arrives. 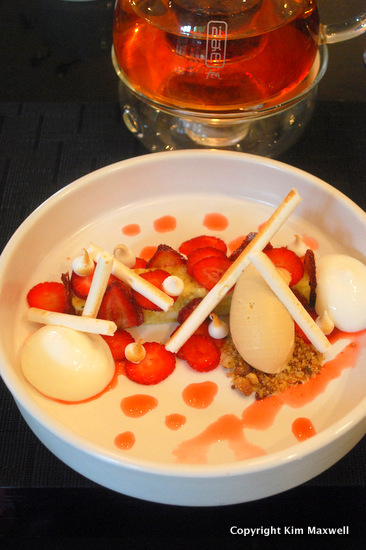 Meringue straws, fresh and dried strawberries, strawberry ice cream and almond crumble all seemed so cheery. The Nigiro strawberry-vanilla loose tea brewed alongside at the table added just the right finishing touch. Done. CAMPHORS AT VERGELEGEN, Vergelegen Wine Estate, Lourensford Road, Somerset West. Tel 021 847-1346. Open for lunch Wed to Sun and dinner Fri to Sat. 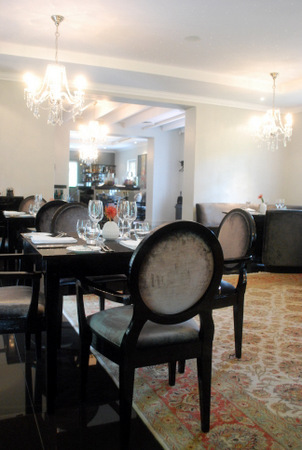 Two-course menu at R275 per person, three-course menu R350, six-course tasting menu R550 – all excluding wine. Six-course tasting menu with wine pairings R750 per person.